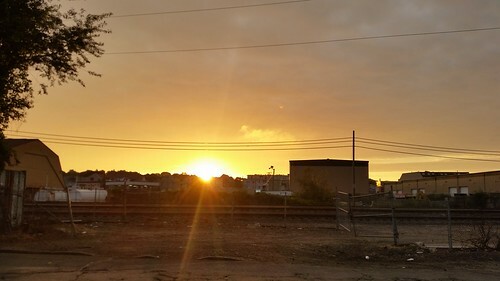 The sun rising up just over the MBTA train tracks in Beverly. I know that many reject the modern world and find it ugly. They privilege nature as pristine, pure, and the real place of beauty. But I don't find that to be the case. Maybe it's because I'm more philosophical on the way in which humans are nature-derived and thus all world is still part of the world and therefore evokes beauty with the right set of lens, but I find scenes of the city as potentially beautiful as I do nature. And when nature and human presence intersect (others distinction, I don't know that these are distinct categories), I find it even more beautiful. So while many would look upon a photo like this and see a modern landscape of detritus and humankind's marks upon the earth, I would see how nature--even when distanced from humankind's day in and day out still finds a way to be intertwined with the human endeavours. In this case, the sun's morning light is like to cast a very different shade about the train tracks than in the afternoon. The hues and shadows create a different perceptual experience than later in the day when such things are transformed by the arcing sun. And to me, I find delight and beauty in that.